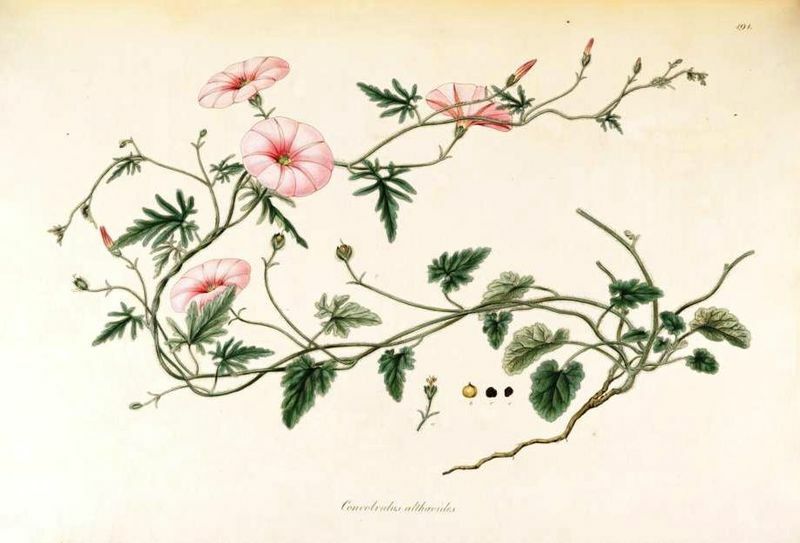 A genus of about 200-250 shrubby annual, perennial herbaceous and rock plants, the name Convolvulus comes from the latin convolvo, referring to the twining habit of some species. It is widely distributed around the world and is commonly known as Bindweed and Morning Glory, both names shared with other closely related genera. 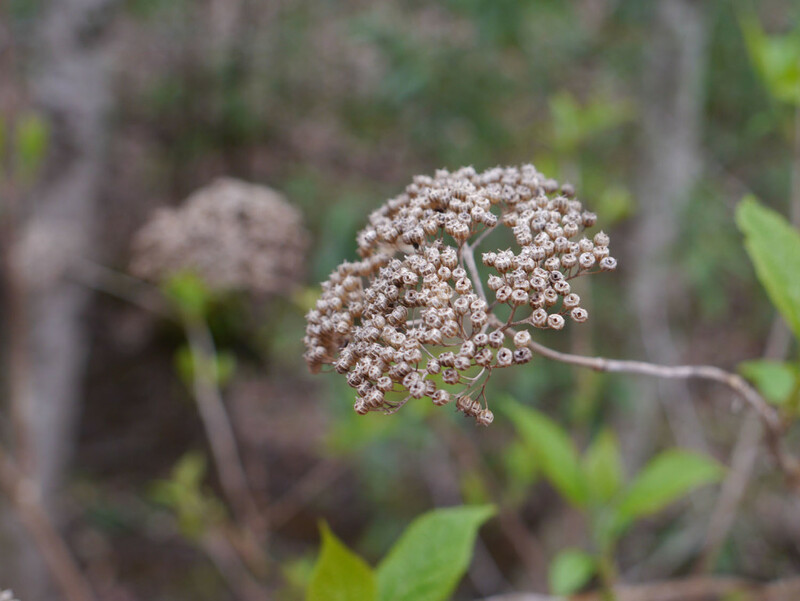 Growing to 0.3–3 m tall, their leaves are spirally arranged, and the flowers trumpet-shaped, mostly white or pink, but blue, violet, purple or yellow in some species. Many of the species are problematic weeds, which can swamp other more valuable plants by climbing over them, but some are also cultivated for their attractive flowers. Some species are globally threatened. Convolvulus species are used as food plants by the larvae of some Lepidoptera. Cornus is a genus of about 30- 60 species of woody trees and shrubs, commonly known as dogwoods. Most are deciduous, but a few are more like herbaceous perennials (subshrubs) and some are evergreen. Cornus is the latin word for ‘horn’ referring to the hardness of the wood. The name “dog-tree” was recorded in 1548, and this had changed to “dogwood” by 1614. After this the plants soon became known as the Hound’s Tree, while the fruits came to be known as dogberries or houndberries (the latter is also the name given to the fruits of the black nightshade- alluding to Hecate’s hounds). The plants may have become known as ‘dogwoods’ from the Old English word dagwood, which refers to the ways it’s slender stems of very hard wood were used to make “dags” (daggers, skewers, and arrows). Another, earlier name of the dogwood in English is the whipple-tree. Chaucer refers to the “whippletree” in The Canterbury Tales (‘The Knight’s Tale- verse 2065). A whippletree is also a part of a horse – drawn cart; the link between the drawpole of the cart and the harnesses of the horses lined up behind one another, and commonly carved from the Whippletree or Dogwood. Cornus are either grown for their flowers, interesting leaves (some both of interest during summer and autumn) or for their colourful winter stems. 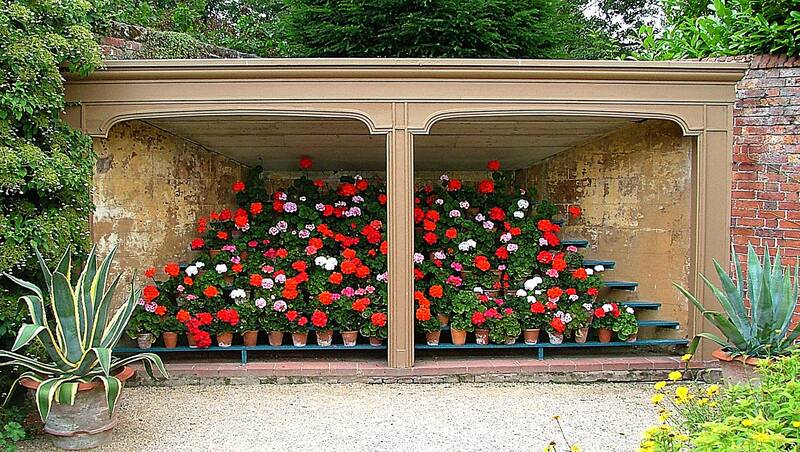 These are just coming into their own in winter gardens around Britain – including Old School Garden. I have several groups of C. alba ‘Sibirica’, C. sanguinea ‘Midwinter Fire’ and C. sericea ‘Flaviramea’ (some grown easily from hardwood cuttings). I ‘stool’ these (i.e. cut the stems to the base) each spring to encourage new growth, which once the leaves have fallen (these are also very colourful in the autumn), reveals bright red, orange and yellow- green stems, which really glow in the winter sunshine..
Michaelmas Daisies or Asters are simply named – from the greek ‘Aster’ meaning ‘a star’- referring to the shape of the flowers (though in truth some are more star – shaped than others). 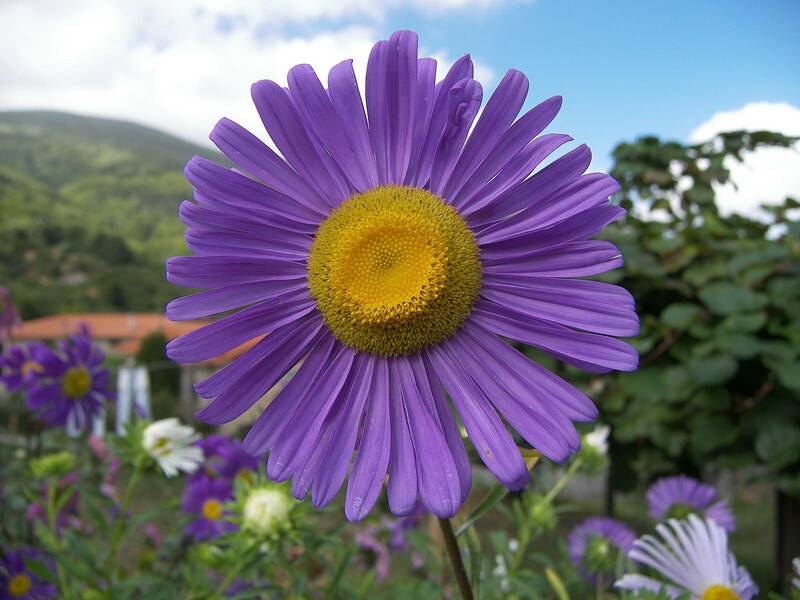 The genus Aster once contained nearly 600 species in Eurasia and North America, but after research on the genus during the 1990s, it was decided that the North American species are better treated in a series of other related genera. After this split there are now roughly 180 species within the genus, all but one being confined to Eurasia. Many species and a variety of hybrids and varieties are popular as garden plants because of their attractive and colourful flowers, which are abundant in the Autumn- hence the association with Michaelmas – the feast of Saint Michael the Archangel (also the Feast of Saints Michael, Gabriel, Uriel and Raphael, the Feast of the Archangels, or the Feast of Saint Michael and All Angels) – 29th September. Because it falls near the equinox, this date is associated in the northern hemisphere with the beginning of Autumn and the shortening of daylight. The Hungarian revolution of 31 October 1918, became known as the ‘Aster Revolution’ due to protesters in Budapest wearing this flower. 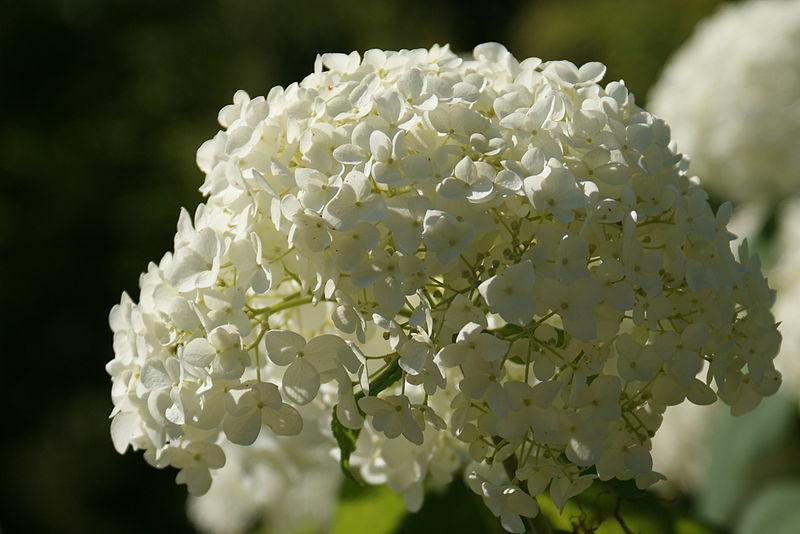 Hydrangea (or common name Hortensia) is based on the greek words for Water (hydor) and Vessel (aggeion) in reference to the shape of their seed capsule. This genus of over 70 species of popular shrubs has delicate heads of flowers in shades of pink, white or blue and pretty autumn colour and leaf shape. The mophead hydrangeas are most well-known for their ability to change colour in different soils. They are native to southern and eastern Asia (China, Japan, Korea, the Himalayas, and Indonesia) and the Americas. By far the greatest species diversity is in eastern Asia, notably China, Japan, and Korea. Most are 1 to 3 meters tall, but some are small trees and other lianas reaching up to 30 m (98 ft) by climbing up trees. They can be either deciduous or evergreen, though the widely cultivated temperate species are all deciduous. Having been introduced to the Azores, H. macrophylla is now very common, particularly on Faial, which is known as the “blue island” due to the vast number of hydrangeas present. There are two main flower arrangements in hydrangeas. Mophead flowers are large round flower heads resembling pom-poms or, as the name implies, the head of a mop. In contrast, lacecap flowers bear round, flat flower heads with a centre core of subdued, fertile flowers surrounded by outer rings of showy, sterile bract-like flowers. Hydrangeas are grown mainly for their large flower heads, with H. macrophylla being by far the most widely grown with over 600 named cultivars, many selected to have only large sterile flowers in the flower heads. Some are best pruned on an annual basis when the new leaf buds begin to appear. If not pruned regularly, the bush will become very ‘leggy’, growing upwards until the weight of the stems is greater than their strength, at which point the stems will sag down to the ground and possibly break. Other species only flower on ‘old wood’. Thus new wood resulting from pruning will not produce flowers until the following season. Hydrangeas are moderately toxic if eaten. H. paniculata is reportedly sometimes smoked as an intoxicant, despite the danger of illness and/or death due to the cyanide! In Japan, ama-cha meaning ‘sweet tea’, is another tisane made from Hydrangea serrata, whose leaves contain a substance that develops a sweet taste. For the fullest taste, fresh leaves are crumpled, steamed, and dried, yielding dark brown tea leaves. Ama-cha is mainly used for the Buddha bathing ceremony on April 8 every year—the day thought to be Buddha’s birthday in Japan. Lonicera (synonym Caprifolium and common names Honeysuckle or Woodbine), is a genus of arching shrubs or twining vines native to the Northern Hemisphere. 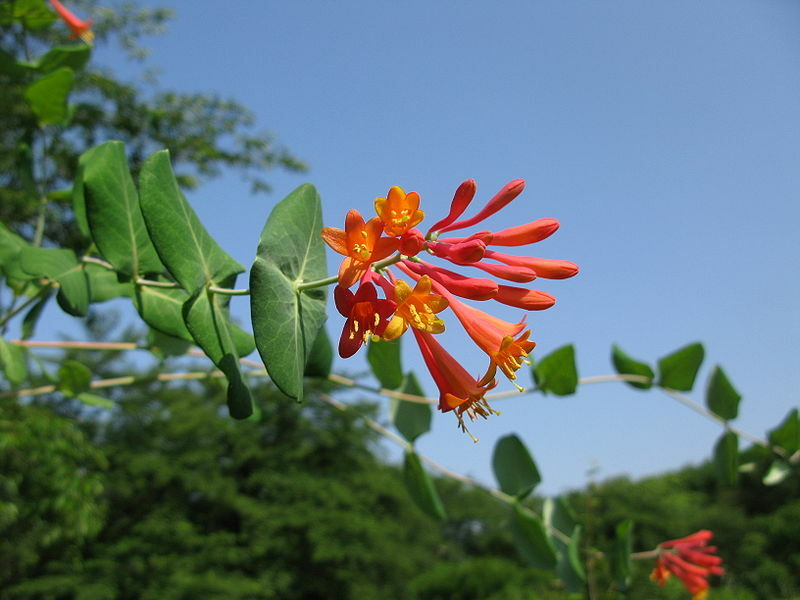 There are about 180 species of honeysuckle, 100 of which occur in China, Europe, India and North America, with about 20 native species in each area. The name Lonicera stems from Adam Lonicer, a Renaissance German botanist (1528 – 1586). He was noted for his 1557 revised version of Eucharius Rosslin’s herbal. Lonicer was born in Marburg and studied here and at the University of Mainz, and obtained his Magister degree at sixteen years of age. He became professor of Mathematics and Doctor of Medicine, becoming the town physician in Frankfurt am Main. His true interest though was herbs and the study of botany. His first important work on herbs, the Kräuterbuch, was published in 1557, a large part dealing with distillation. The common honeysuckle (L. periclymenum) is a vigorous twining plant with large cartwheel-shaped flower-heads made up of rings of curved, almost tubular shaped individual flowers, which open white, but often red-flushed, for most of the summer. The plants climb rapidly up trellis or over arches, where they associate well with climbing roses or other varieties of honeysuckle. They are also superb trained up into trees or covering old tree stumps. Delphinium is a genus of around 300 species of flowering perennial, biennial and annual plants that are native throughout the Northern Hemisphere and also on the high mountains of tropical Africa. The name “delphinium” derives from the Latin for “dolphin”, referring to the shape of the nectary, though there is also a story that in ancient Rome men were pursuing a dolphin for commercial exploitation so Neptune turned it into the Delphinium! D. zalil = native Afghanistan name. The delphinium is much admired, particularly in the cottage garden setting. Delphiniums are tall, majestic plants with showy open flowers on branching spikes. Each flower has 5 petal-like sepals with 2 or 4 true petals in the centre called a bee. Delphinium species include all three primary colours, blue, red, and yellow. Hybridisation of delphiniums has resulted in many new colours and attractive flower forms and growing heights. Most garden Delphiniums are of the hybirds raised from species such as elatum, formosum, grandiflorum and sulphureum. 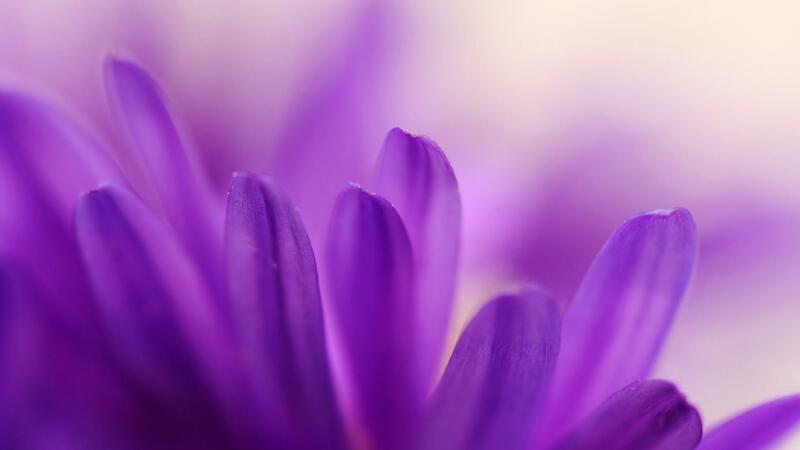 Flower colours range in shades of blue from palest sky, through to gentian and indigo; rich purple, lavender, pink to purest white. In England Blackmore and Langdon, nurserymen and leading breeders of Delphiniums, were producing hybrids from early in the 20th century, producing named varieties of large well-formed delphiniums. Others have also added their skills and developed the most dramatic and eye-catching plants to grace our gardens. Special thanks to Les Palmer, whose new book ‘How to Win your Pub Quiz’ was published recently. A great celebration of the British Pub Quiz! The bright golden plates of Achillea are coming into bloom in Old School Garden and they look splendid, too. Achillea millefolium is commonly known as Yarrow – a name often applied to other species in the genus which is made up of about 85 flowering plants. Achillea is native to Europe and temperate parts of Asia and a few grow in North America. Achillea can be mat-forming or upright perennials, mostly herbaceous, with sometimes aromatic, pinnately divided or simple and toothed leaves and flattened clusters of small, daisy-like flower-heads. These heads of small flowers sit like mini helicopter pads at the top of the stem, the flowers being white, yellow, orange, pink or red. The Achillea is a useful source of food for the larvae of some moths. The genus was named after the Greek mythological hero Achilles. According to the Iliad, Achilles’ soldiers used yarrow to treat their wounds, hence some of its common names such as allheal and bloodwort. I somehow have the idea that the flower plates are also reminiscent of Achilles’ ‘burnished shield’ (assuming he had one) and it’s this connection that I’m reminded of whenever I see them. Achilleas are traditional border flowers valued for their feathery foliage and striking flat, circular heads of flowers throughout the main summer season. They team well with other perennial flowers and are a vital ingredient of a traditional herbaceous border. They are also at home in island beds, cottage gardens and other perennial planting schemes.They look good with Leucanthemum and Kniphofia. Nicotiana is a wonderful garden plant, its highly scented flowers providing a heady scent on warm summer evenings. I grew a large group of N. sylvestris one year which provided both an eye – catching feature and intoxicating fragrance for my younger daughter’s wedding celebration – truly memorable. I guess ‘intoxicating’ is the right term as the tobacco plant is one of the most important plant discoveries in history, albeit one whose chief product we have come to understand and increasingly reject as a major cause of disease. Fortunately though, the ‘baby hasn’t been thrown out with the bath water’ and we can still appreciate it as a garden plant, and its one which I grow each year and place in groups around Old School Garden as well as along the main entrance path at Gressenhall Museum where I volunteer. Indigenous to the Americas, Australia, south west Africa and the South Pacific, there are various Nicotiana species, all commonly referred to as ‘tobacco plants’, though it is N. tabacum that is still grown worldwide for production of tobacco leaf for cigarettes etc. Nicotiana can be annuals, biennials, perennials or shrubs – some 70 species are grown as ornamentals. N. sylvestris is a stately plant which looks well at the back of a lightly shaded or sunny border, or grown in bold groups. It’s flower heads seem to explode like a graceful firework. The Royal Horticultural Society has given it its prestigious Award of Garden Merit (AGM). There are many variations in size, colour and fragrance between the species and hybrids. Older heirloom species are often identified by their genus and species name. Its genus name, designated by Linnaeus in 1753, recognizes Frenchman Jean Nicot, ambassador to Portugal from 1559-1561 who brought powdered tobacco to France to cure the Queen’s son of migraine headaches. 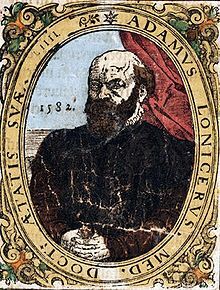 Leonhart Fuchs (1501-1566) coined the name ‘Nicotiana’. However, Nicot’s credit as the first to bring the plant to Europe is wrong as it was known in the Low Countries after being brought there by Spanish merchants in the 1540s. Knowledge of the plant by Europeans dates from 1492 when Columbus’s sailors saw it being smoked in Cuba and Haiti. Many of the species names refer to a characteristic of the plant. Nicotiana alata gets its species name from the Latin word meaning winged, referring to its winged petioles (the stalks attaching the leaf blades to the stem). N. sylvestris, from the Latin sylva, meaning of the forest or woodland, possibly refers to its native habitat. N. langsdorffii was named after G. I. Langsdorf, the Russian Consul in Rio de Janeiro who organized an expedition to explore the inner regions of Brazil in the 1820’s. Nicotiana can be used as specimen or bedding plants, in borders, woodland gardens or containers. Heights range from less than 1 foot to over 10 feet. They are long-blooming, attractive plants with trumpet-shaped flowers in shades of green, white, red, and pastels. Some species have attractive foliage. They are fairly easy to grow from seed. Contact with the hairy foliage may irritate the skin. This year I’m growing N. sylvestris in a border along with Verbena bonariensis and Ammi majus – a new combination for me and I’ll show you the results later in the summer! Just about now many of the heritage gardens of Britain are coming alive with Rhododendron colour. Rhododendron is named from the ancient Greek words for “rose” (rhódon) and “tree” (déndron). It is a genus of over 1000 species of woody plants in the heath family, and are either evergreen or deciduous. Most species have showy flowers. Rhododendrons are extensively hybridized in cultivation, and natural hybrids often occur in areas where species ranges overlap.They were introduced to the UK in the late 18th century from the Himalayas and China. Azaleas (a section of generally small-sized, small-leaved and small-flowered shrubs), further divided into deciduous and evergreen hybrids. They are distinguished from “true” rhododendrons by having only five anthers per flower. R. balsamiaeflora = balsam-flowered, the double flowered florist’s balsam. The rhododendron is the national flower of Nepal, where the flowers are considered edible and enjoyed for their sour taste. The pickled flower can last for months and the flower juice is also marketed. The flower, fresh or dried, is added to fish curry in the belief that it will soften the bones! Some species of rhododendron are poisonous to grazing animals because of a toxin in their pollen and nectar. Rhododendron is extremely toxic to horses, with some animals dying within a few hours of ingesting the plant. People have been known to become ill from eating honey made by bees feeding on rhododendron and azalea flowers. Xenophon described the odd behavior of Greek soldiers after having consumed honey in a village surrounded by Rhododendron ponticum during the ‘March of the Ten Thousand’ in 401 BC.Pompey’s soldiers reportedly suffered lethal casualties following the consumption of honey made from Rhododendron deliberately left behind by Pontic forces in 67 BC. Later, it was recognized that honey resulting from these plants has a slightly hallucinogenic and laxative effect., the suspect rhododendrons being R. ponticum and R. luteum (also known as R. flavum). Eleven similar cases have been documented in Turkey during the 1980s. The effects of R. ponticum was mentioned in the 2009 film Sherlock Holmes as a proposed way to arrange a fake execution. Rhododendrons are grown for their spectacular flowers, usually borne in spring. Some also have young leaves and stems covered in a striking dense woolly covering (indumentum) and some – the deciduous rhododendrons or azaleas – have good autumn colour. Some species (e.g. Rhododendron ponticum in Ireland and the United Kingdom) are invasive plants, spreading in woodland areas replacing the natural understory. R. ponticum is difficult to eradicate, as its roots can make new shoots. Yesterday was sunny but breezy, so my wife and I and two friends went out for a delightful walk in the local countryside, followed by Sunday lunch at a local pub. On the walk we came across signs to a ‘bluebell event’ and passed by the house and garden where this was taking place, but alas, could not spot any but a couple of rather weak looking bluebell blooms. Having been attracted out to another such event publicised a week or so ago (when in a ‘normal’ spring the Bluebells should have been well into flower) and been disappointed, I was skeptical that there was any real show on offer, especially as the bluebells at ‘Old School Garden’ were nowhere to be seen other than making a few clumps of lush foliage! So, the late spring was once again (not) in evidence! We did, however, see some patches of Wood Anemone (Ranunculus nemorosus, meaning found in groves) amongst larger swathes of Lesser Celandine (Ranunculus ficaria, meaning fig like, referring to the heart- shaped leaves), that reliably invasive yellow – flowered creeper. According to Gilbert White, the famous diarist writing around 1800, the Lesser Celandine flowers came out on February 21, but it is more commonly expected between March and May these days, and is sometimes called the “spring messenger”. The name Ranunculus comes from the latin for “little frog,” (rana = frog and a diminutive ending). This probably refers to many species being found near water – just like frogs! It is a large genus of about 600 species in the similarly named family Ranunculaceae. Members include buttercups, spearworts, water crowfoots as well as the lesser Celandine. According to the Oxford English Dictionary, Celandine comes from the latin chelidonia, meaning swallow: it was said that the flowers bloomed when the swallows returned and faded when they left. The common name Celandine is used to describe three different plants; as well as Lesser Celandine (a Ranunculus) there is Greater Celandine (Chelidonium majus, in the poppy family) and the Celandine Poppy (Stylophorum diphyllum, also in the poppy family). Most Ranunculus are herbaceous perennials, with bright yellow or white flowers (if white, they still come with a yellow centre), though some are annuals or biennials. A few species have orange or red flowers. There are usually five petals, but sometimes six, numerous, or none, as in R. auricomus. The petals are often highly lustrous, especially in those with yellow flowers (e.g buttercups). Buttercups usually flower in the spring, but flowers may be found throughout the summer, especially where they are unwelcome garden weeds! The name buttercup may derive from a false belief that the plants give butter its characteristic yellow hue (in fact it is poisonous to cows and other livestock). A popular children’s game involves holding a buttercup up to the chin; a yellow reflection is supposed to indicate a fondness for butter! In the interior of the Pacific Northwest of the United States the buttercup is called “Coyote’s eyes”. In the legend behind this the Coyote was tossing his eyes up in the air and catching them again when the Eagle snatched them. Unable to see, Coyote made eyes from the buttercup! Ranunculus species are used as food plants by the larvae of some butterflies. 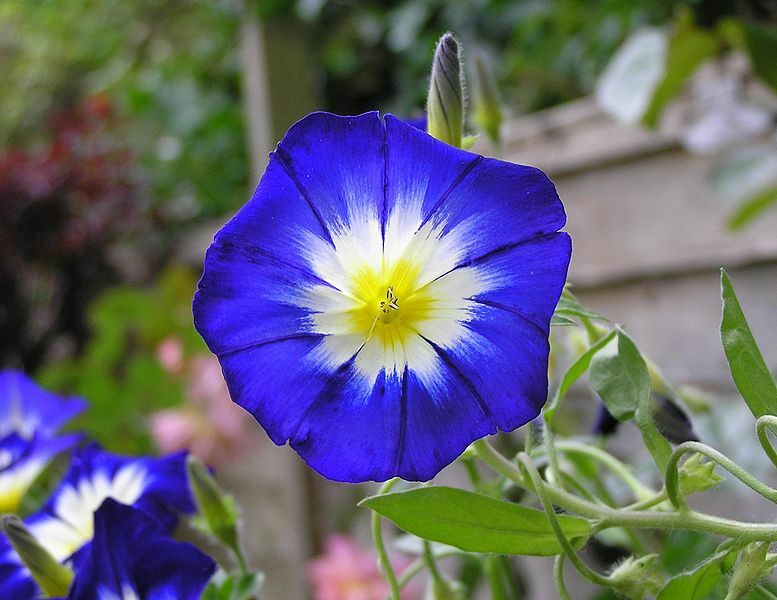 Some species are popular ornamental flowers, and many cultivars have large and brightly coloured flowers. When Ranunculus plants are handled, a naturally occurring substance, ranunculin is broken down to form a toxin known to cause dermatitis in humans and care should therefore be taken when handling large numbers of the plants. The toxins are degraded by drying, so hay containing dried buttercups is safe. The Lesser Celandine plant used to be known as Pilewort because it was used to treat haemorrhoids. Supposedly, the knobbly tubers of the plant resemble piles, and according to the ‘doctrine of signatures’ this resemblance suggests that Pilewort could be used to cure piles! The German vernacular Scharbockskraut (“Scurvyherb”) derives from the use of the early leaves, which are high in vitamin C, to prevent scurvy. The plant is widely used in Russia and is sold in most pharmacies as a dried herb.